De Beauvoir said this piece, at the aesthetic end of Sartre’s spectrum, was to be a book-length study of the Renaissance painter Tintoretto, foreshortened because Sartre disliked its style, which is simultaneously flip and outlandish. The central conceit is that Venice hated Tintoretto for unmasking its angst and bankruptcy. Sartre’s focus on profit motive and careerism is a lesson to more misty-eyed biographers, and provides a vivid (Marxist) portrait of Venetian society. 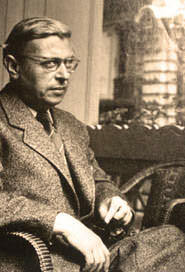 Sartre surmises that ‘this fidgety little dyer’ suffered severely from his solitude as an artist precisely because of his frenzied bourgeois ambitions. Hilarious and profound in equal measure.